4. Who ARE these clowns? 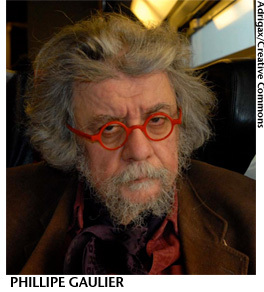 Interest was renewed in French clown professor Philippe Gaulier after his student Dr Brown won the 2012 Edinburgh comedy award – even though he already boasted an impressive list of alumni including Emma Thompson and Sacha Baron Cohen. At the 72-year-old's school outside Paris, he teaches students how to exploit their own weaknesses – the side of them that people laugh at behind their back – to create their stage persona. Such brutal honesty can be a harsh learning curve, but it has helped define a new generation of comedy performers. Here are ten Gaulier acolytes performing at this year's Fringe. New Zealander Wakenshaw scooped armfuls of awards and critical acclaim for his perfectly judged physical comedy, Kraken last year – see our review here. He's bringing that back for a full run at Underbelly Cowgate at 18:00, while presenting his new show Nautilus at Pleasance Courtyard at 22:00. This is very much in the same bizarre vibe as its predecessor, even if we found the stream of consciousness a bit more self-indulgent in its Melbourne run earlier in the year. George Colebrook and Joe Boylan – or Jojo Calypso and Gorgee to use their stage names – promise a 'land of pure idiocy' for their PG-rated show at Laughing Horse @ Espionage at 14:00. And surely no sketch group has a more stupid, meaningless name. • 10 Australians heading to the Fringe.